The Verbal Mosh Ep. 144 can be heard here. 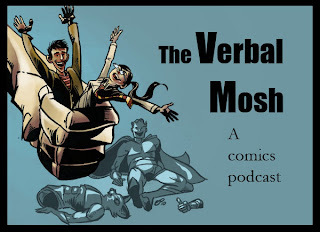 This week on The Verbal Mosh, we review Action Comics #4. Superman's outfit gets dirty and torn, showing it's not just the female characters that show a little skin. Amazing Spider-man #675, Animal Man #4, Avenging Spider-man #2. If Red Hulk is Rulk, shouldn't She-Hulk be Shulk? Chew #22. Guest starring our cat, Randy Orton, in the letter column! Moon Knight #8, Swamp Thing #4, and Sweet Tooth #28. Write us an iTunes review. They're much appreciated.